Exalt 4: Equip a +5/+0 Heirloom Greatsword to Enamor's Keeper. 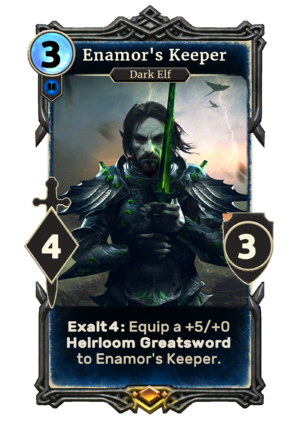 Enamor's Keeper is a legendary Intelligence creature card. It is part of the Houses of Morrowind expansion. "They have no wit nor poetry." "Lord Vivec gave me this personally." "THIS is how an artist fights." This card depicts Salyn Sarethi, a Buoyant Armiger, who first appeared in Morrowind as the owner of the dagger Enamor.